The Advanced Placement (AP) Program allows students to get a head start on college while they’re still completing high school. AP classes are offered at high schools around the world to students from freshmen to seniors. These classes give students a chance to complete rigorous, college-level coursework in a variety of subject areas. Students may elect to take an AP test administered by the College Board after completing the associated class. Passing grades on a test may result in college credit or placement out of introductory-level courses, depending on the policies of the college that the student later attends. Many high schools choose to participate in the Advanced Placement Program, a program that allows them to offer a variety of AP classes to qualified students. There are 38 different AP courses offered to students throughout their high school careers, though not all high schools offer every AP class. For instance, a school that doesn’t employ a Chinese teacher will not be able to offer AP Chinese Language and Culture. However, students who want to take a class that is not offered at their schools may be able to work out an arrangement with their high school guidance counselors (involving dual enrollment or taking an online course). Why should I take AP classes? AP courses are the highest level of coursework that a student can take in high school, preparing them for the rigors of academic work in college. Having good grades in AP classes and passing grades on the associated tests may be enough to catch the eye of a college admissions counselor. Particularly impressive are older students who elect to take the most challenging classes offered by their high schools, even if they don’t need them to graduate, and students who have taken AP classes consistently throughout their high school careers. Besides making students into competitive applicants, passing grades on AP exams may be immediately transferable into college credit or placement out of introductory-level college classes. Different colleges have different score requirements for credit and placement. Search for your prospective institutions and their AP policies here. What AP classes can I take? 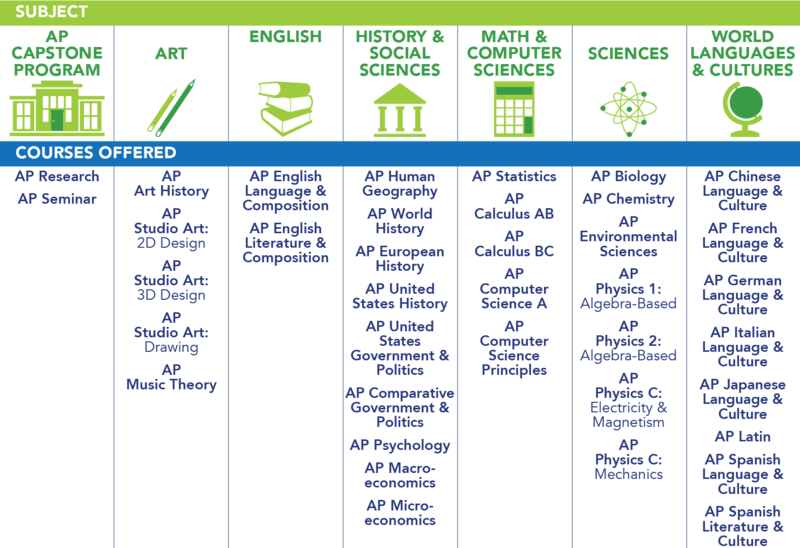 Though not all classes are offered at all high schools, there are 38 different AP courses that may be offered to students throughout their high school careers. Loading up your schedule with AP classes may sound like a great idea, but you have to make sure to factor in how much time and effort each class will require. Since AP classes are taught at a higher level, the associated workload is higher than in advanced or honors classes. Take no more AP classes than you would feel comfortable taking. A good rule of thumb is to try out one or two AP classes as a freshman or sophomore, and then adjust your course load the following years. If managing two AP classes as a sophomore was easy, try taking three as a junior. Remember, senior year, you will have a heavier workload during the fall semester as you plan for the future and/or apply for college. Don’t take so many classes that you don’t have time to complete your other obligations. Can I take an AP test without having taken the associated AP class? You are not required to have completed an AP class before taking an AP test. However, having adequate coursework and background in the subject is necessary if you hope to earn a passing score. If you feel prepared for the material that will be on the test, you may go ahead and register for your exam(s). Talk to the person at your school who is in charge of AP testing to learn more about the registration process. If you are homeschooled or currently attending a school that does not offer AP courses, you will need to contact AP Services by March 1 to learn where in your area you will be able to take the test(s). You will be given contact information for local AP coordinators, and you must get in contact with them by March 15. When talking to AP Services and your local coordinators, explain your situation, list which tests you want to take, and mention any disabilities that you have to make sure that you receive accommodations. How do I register for an AP test? Registration for AP tests occurs in person with an AP coordinator at your school. If you are currently enrolled in AP classes, your teacher will give you details about how and when you need to register. If your teacher doesn’t volunteer this information or you are hoping to take an AP test without taking the associated class, ask an AP teacher or your guidance counselor about deadlines. Each test costs $94.00 with the exception of exams associated with the AP Capstone. These tests are $142.00 each. Again, students who are homeschooled or who attend schools that do not offer AP tests will have to contact AP Services by March 1 to find a test site and get in touch with a local coordinator. Students must contact their local coordinators by March 15 to sit for spring tests. Are there any subject-specific rules? Students may not take Calculus AB and Calculus BC during the same year. Students who are taking multiple Studio Art tests must pay a separate registration fee and submit a portfolio of work for each test. What if two exams I want to take are scheduled at the same time? If two exams are offered at the same time, it is possible to take both. Talk to your teachers or your AP coordinator about registering for one of the tests during a late-testing period (there may be an additional fee). Tests are typically scheduled for early May. Are there fee waivers for eligible students? Yes. Students who can demonstrate financial need may be eligible for a $32.00 reduction in the registration fee for each test from the College Board. Individual schools can offer an additional $9.00 reduction (the result of foregoing a rebate that schools earn for each exam given), making the total cost of each test $53.00 ($101.00 for AP Capstone-related exams). While federal funding reduced the cost of AP exams even more prior to 2017, the AP Test Fee Program has now ended. Some states and schools may be able to secure additional funding, thereby reducing the cost of each exam further, but this is not a guarantee. For more information about how and when to apply for a fee waiver, contact your AP coordinator. There are accommodations available for students with documented learning and physical disabilities. If you have previously taken a College Board test (the PSAT/NMSQT, the SAT, SAT Subject Tests, or other AP tests) and received accommodations for that test, you do not have to reapply. If you have not taken a College Board test, you will have to apply for accommodations. This process takes up to seven weeks, so send in your request early. In 2018, the deadline to request disability accommodations was February 23. Contact your school’s Services for Students with Disabilities coordinator for help applying. You will be required to submit supporting documentation detailing your disability and specifying which accommodations you need to successfully take your AP test(s). When will my scores be released? AP test scores are released mid-summer, typically in July. At this time, your scores will be available to you online and mailed to the institution that you specified at test time. You can view your scores online through your College Board account using your AP number or student ID number. Once logged in, you will be able to see your scores and where they’ve been sent. The score report sent to your chosen institution includes all AP tests that you’ve taken, minus any scores that you’ve had canceled or chosen not to send. AP tests are scored from 1 to 5, (1 meaning that your test results do not show you are capable of completing introductory college-level coursework and 5 meaning that you are highly qualified). This score is based on both your multiple-choice and written answers. Typically, you need to score at least a 3 (qualified) to earn any college credit, but each college has a different policy about the specific AP scores it will accept for credit in each subject. For example, St. Olaf College will provide 1 credit to students who score at least a 4 on the AP Art History test, but the University of Wisconsin-Madison will award 3 credits to students who earn at least a 3 on the same test. Check out your prospective institution’s policy here and confirm the results with information provided on your institution’s admissions website. How do I send scores to my prospective institutions? When you register for your AP test(s), you will be able to input one institution to which you would like a score report sent. This report will contain scores from all AP tests that you have ever taken, unless you’ve had a score canceled or you choose to withhold a score. If you want to send your AP score report to any additional institutions, you will have to pay $15.00 for each report (and an extra $10.00 each if you want to rush processing). You can order more score reports through your College Board account, or if that does not work for you, you may order additional reports by sending a written request and payment to AP Services by mail or fax. What is an AP Scholar? Students who take a variety of AP tests may become AP Scholars and receive commendations from the College Board. This is not a monetary reward, but it is something that may be listed as an honor on a student’s résumé or mentioned on a college application. The basic AP Scholar award is given to students who score at least a 3 on at least three AP tests. However, there are additional awards granted to students who take more AP tests and achieve higher scores on these tests.